004. ROBERT F. SCOTT. Issued by Nicolas Sarony and Co. (1923). It is card number 75 from a second set of 50 cards entitled "Celebrities and their Autographs". The card was included as a premium in a packet of 10 'Sarony' cigarettes. Size: 2.8+" x 1.7-"
Recto: No. 75 | Photograph of Scott in naval uniform, his signature appearing below. Verso: Celebrities | and their | Autographs | Captain Robert F. Scott | From a photo by Maull and Fox | His original signature, written on the day of his death (March 29th, 1912), can be seen at the British Museum, London, on the last page and volume of his Journal of the Antarctic Expedition, 1910-12. Born at Outlands, Devonport, June 6th, 1868. Educated for the Navy at Fareham. Served as Midshipman on the Monarch and as Lieutenant on the Rover, 1887-88. 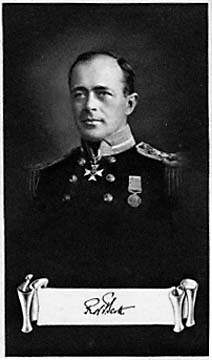 Promoted to Commander, he headed the National Antarctic Expedition, sailing from London, August, 1901, returning in September, 1904. Headed second Polar Expedition and sailed from New Zealand on the Terra Nova, November 29th, 1910. With Wilson, Oates, Bowers and Evans reached South Pole, January 18th, 1912,	one month after Amundsen. The entire party perished on the return journey. | NICOLAS SARONY & CO. | Cigarette Specialists | New Bond St., LONDON, W.
Note: There's another version of this which has the number (75) at the bottom of the card in an oval and is larger in size (3.1" x 2.5").